Eyefootball.com prides itself on having the very latest technology available for our writers to use. Amongst one of the objectives on our company mission statement is to provide an article publishing tool that anyone with a laptop or mobile device is able to use from anywhere in the world with an internet connection, thus we created the easy publisher. Firstly, if you would like to become a member of our writing team, you will need to create an account on our website that will provide you full publishing access rights on our website. Firstly, provide your email address and then choose a username and password. Ensure that your password is - at the very least - six characters. From there, you will be required to enter your full name and more information about your interests, such as your favourite football league and football team. Once you have logged into the site, under the menu option 'myEye', you will be able to start publishing an article. From here, you are required to enter a title. This is one of the most important parts of the article publishing process. We normally ask that you include a player name if it is related to one person in particular, whilst also including a team name in the URL as well. Make it imaginative and crucially, include words that are likely to be favourable for search engines so that the article is properly indexed and can be located from the likes of Google. 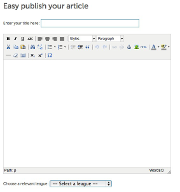 From there, in the large text box you will be able to start writing an article. At the bottom right corner you should also notice a word counter. We request normally that articles contain 200 or more words, particularly when it comes to any football transfer story. This is where a lot of our traffic comes from, so please kindly try to make sure the content has a good amount of quality and quantity. Afterwards, you will also be asked to choose a league that the article is relevant to. If the main bulk of the story is about the Premier League, then select that football league. If the story is, for example, about the transfer of a player from a top Eredivisie side to a Bundesliga team; it would probably be best to select the German division as the primary league for the publisher. Once you have submitted your article, the story will go into our editorial system. Our team of editors will then take responsibility to either approve or reject the article and will also possibly tweak your story and the content. Once it has been approved, you will receive an email notification to your inbox. Thank you for your interest in eyefootball.com. We are always busy looking for new writers, so please consider joining our team. Our website is famous for sourcing the very latest football transfer stories as soon as they break. Take a look at our Football News Centre for the very latest stories from all over the globe.